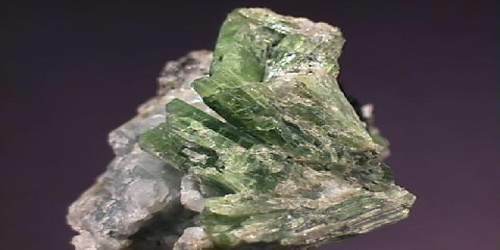 Amphibole is any of a large group of usually dark minerals composed of a silicate joined to various metals, such as magnesium, iron, calcium or sodium. Amphiboles can be green, black, colorless, white, yellow, blue, or brown. 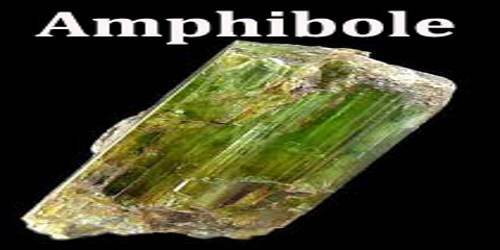 The International Mineralogical Association currently classifies amphiboles as a mineral supergroup, within which are two groups and several subgroups. Hornblende is the most common subgroup of minerals in amphibole. Metallic ions found in different types of amphiboles include iron, magnesium, calcium, aluminum, and sodium ions. 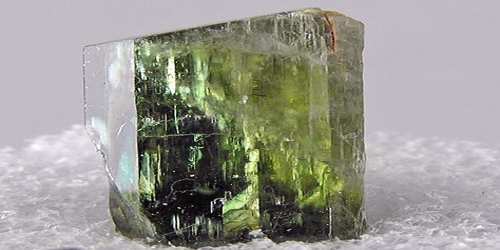 The name amphibole (Greek αμφιβολος/amfibolos, meaning “ambiguous”) was used by René Just Haüy to include tremolite, actinolite, and hornblende. This term has since been applied to the whole group. There are 5 major groups of amphibole leading to 76 chemically defined end-member amphibole compositions according to the British mineralogist Bernard E. Leake. Because of the wide range of chemical substitutions permissible in the crystal structure, amphiboles can crystallize in igneous and metamorphic rocks with a wide range of bulk chemistries. The combination of prismatic form and two diamond-shaped directions of cleavage at about 56° and 124° is the diagnostic feature of most members of the amphibole group. The essential characteristic of the amphibole structure is a double chain of corner-linked silicon-oxygen tetrahedrons that extend indefinitely parallel to the c crystallographic axis, the direction of elongation. The fundamental building block of all silicate mineral structures is the silicon-oxygen tetrahedron (SiO4)4-. It consists of a central silicon atom surrounded by four oxygen atoms in the shape of a tetrahedron. The similarity between the crystal structures of the major layer silicates (clays and micas) and the chain silicates (pyroxenes and amphiboles) has long been recognized. The specific gravity values of amphiboles range from about 2.9 to 3.6. Amphiboles yield water when heated in a closed tube and fuse with difficulty in a flame. Their colour ranges extensively from colourless to white, green, brown, black, blue, or lavender and is related to composition, principally the iron content. Glaucophane and riebeckite are usually blue. Anthophyllite is gray to various shades of green and brown. 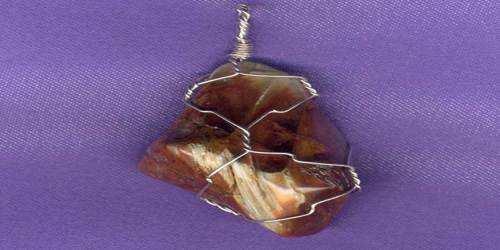 The cummingtonite-grunerite series occurs in various shades of light brown. Iron-free varieties of tremolite containing manganese can have a lavender colour. The common crystallographic habit of amphiboles is acicular or prismatic; however, most of the amphiboles are also known to crystallize in the asbestiform habit. Amphibolite is very hard and takes a high polish. The combination of its ability to be polished, its dark color and its texture have made amphibolite a popular dimension stone in construction. It is used as paving stones and as a veneer or facing on buildings, both for interior and exterior use.